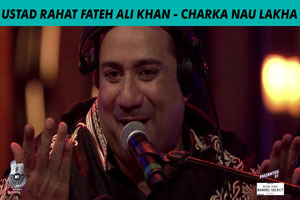 A traditional qawwali sung by Rahat Fateh Ali Khan featuring him in song video. The video of this song is available on YouTube at the official channel MTV Unplugged. This video is of 10 minutes 16 seconds duration. Lyrics of "Charka Nau Lakha"
Lyrics in Hindi (Unicode) of "चरखा नौ लक्खा"